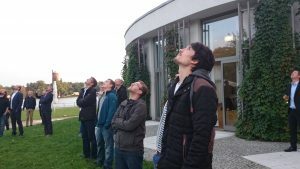 Hosted at the scenic location in the center of Potsdam, close to the river Havel, this 3rd GeoMonday turned out to be a really nice occasion for all drone enthusiasts. Our first outdoor hands on session was blessed with rays of sunlight from a Indian summer sun. Thanks again to the interested audience and to all of our fantastic speakers. 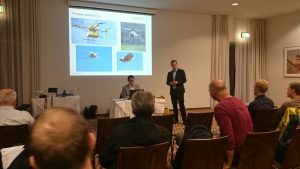 The session was kicked-off with the live data collection session using a smart drone, presented by Arno Fischer, professor at the University of Applied Sciences Brandenburg. 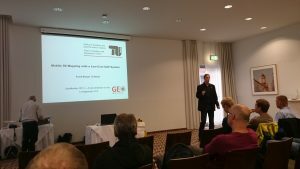 Immediately afterwards Frank Neitzel, professor at the Technical University (TU) Berlin, told us how to build a drone from very affordable components and get the system working. Center (EASC) in Germany. He spoke about the chances and challenges of unmanned aviation. OpenAerialMap, OpenDroneMap, OpenUAV – there are plenty of new projects around the idea of leveraging UAVs and digital cameras as a map data source. 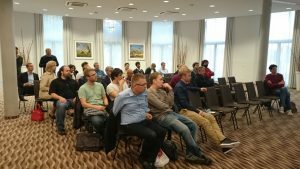 They are all following OpenStreetMap’s idea of creating a new map data source that is open. 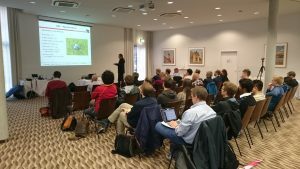 The talk will give an overview of the OpenAerialMap initiative and how to use the OpenDroneMap (ODM) software package to create 3D models and ortho-images. Some thoughts about the meaning and future of ubiquitous UAV technology for data capturing and surveying will a lso be presented. Martin Scholl is a software engineer and 3 times company founder. His current focus is 3D digital perception and digitalization with applications in robots, autonomous systems, and art marketing. One of the most discussed topic of the recent years is the rise of UAVs, MAVs, RPVs or simply drones. These flying devices are equipped in their latest evolutions not only with full HD cameras, but also GPS devices and even small computers. This equipment is the base for next generation aerial geo-data and services. In the 3rd edition of GeoMonday we will cover the whole lifecycle from the creation, processing up to the integration for location intelligence or services. It’s a special pleasure for us to have our session for the first time in the beautiful city center of Potsdam, thanks to our Partner Zukunftsagentur Brandenburg.